San Remo Club is a private waterfront condominium community situated on the East side of the Intracoastal Waterway in Boca Raton, FL. San Remo is situated on 13.5 acres of impeccably landscaped waterfront property, which includes 450 feet of private beach front as well as a full marina with plenty of deep water dockage for resident boat owners. San Remo Club in Boca Raton is comprised of several mid-rise condominium buildings with just 293 condo units in total. With eight unique floorplans from which to choose, there is sure to be a condo to suit every homebuyer in this intimate waterside community. San Remo condos offer one to three bedrooms and generally range from 780 to 2,080 square feet of living space. With a diverse selection of affordable condos for sale, San Remo Club offers some of the best value in waterfront real estate in Boca Raton, FL. Many of the condos for sale at San Remo Club have been completely renovated to include many highly desirable upgrades. Features commonly found in San Remo condos for sale include new hardwood or tile flooring, hurricane impact resistant windows and sliders, remodeled kitchens with custom cabinetry, stainless steel appliances, and granite countertops, spacious walk-in closets, and luxurious master suites. Residences also feature screened balconies with unobstructed water views of the community marina, the Atlantic Ocean, and the Intracoastal Waterway. Many of the units also have expansive waterfront terraces, central vacuum, and in-unit washers/dryers. San Remo Club was originally built in 1967, but has recently undergone many renovations. Recent renovations at San Remo Club include complete concrete restoration to all of the condominium buildings, as well as updates to many of the community amenities and common areas. San Remo Club is an active community that offers residents an array of resort-style amenities that can be enjoyed year-round. San Remo Club offers private deeded beach access with a private beach pavilion, full marina that includes a common dock, fully-equipped fitness center, oversized heated swimming pool, jacuzzi, saunas, shuffleboard courts, outdoor picnic area with grills, and biking and jogging paths. There is a very active clubhouse with a busy social calendar of activities and events that foster a friendly atmosphere and strong sense of community at San Remo Club. San Remo Club also offers a community laundry room, community library, extra storage, and secure garage parking beneath the buildings. Security at Sam Remo includes a 24-hour manned gated entrance and roving security patrol. San Remo Club is located between the magnificient Boca beachfront and the Intracoastal Waterway on the west side of Ocean Blvd (A1A), just south of Spanish River Boulevard in Boca Raton, FL. This prime location offers San Remo Club residents the best of both worlds. Residents enjoy the convenience of being just steps from the 450 square feet of private deeded beach that is just across A1A, as well as the ability to hop on a boat from the on-site marina and cruise down the Intracoastal Waterway to Lake Boca or directly to the Atlantic Ocean. San Remo Club is just a short walk from many of Boca Raton's gorgeous natural parks, Gumbo Limbo Nature Center, and Red Reef Golf Course, as well as some of the best shopping, dining, and entertainment venues in the area. The community is surrounded by similar luxury condominium communities such as the Sea Ranch Club of Boca and Yacht & Racquet Club, which also offer a diverse selection of beautiful condominiums in an exceptional location close to all that Boca Raton has to offer. If you would like to learn more about San Remo Club condominiums, or any of the other waterfront condominiums in Boca Raton, please call us at (561) 235-7800. You may also provide your contact information on the brief online contact form provided below and one of our luxury condominium specialists will reach out to assist you. 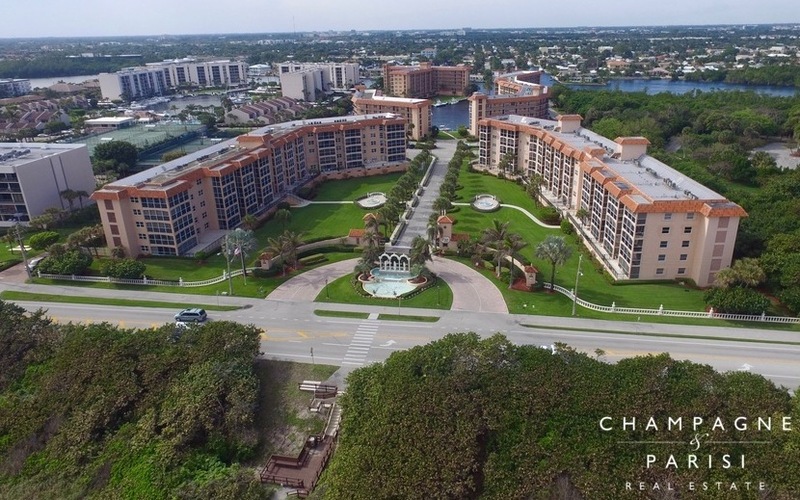 We at Champagne & Parisi Real Estate are committed to providing the highest level of service and customer care when helping our clients achieve their real estate goals, and would be delighted to assist you in finding the condo of your dreams in Boca Raton, FL!